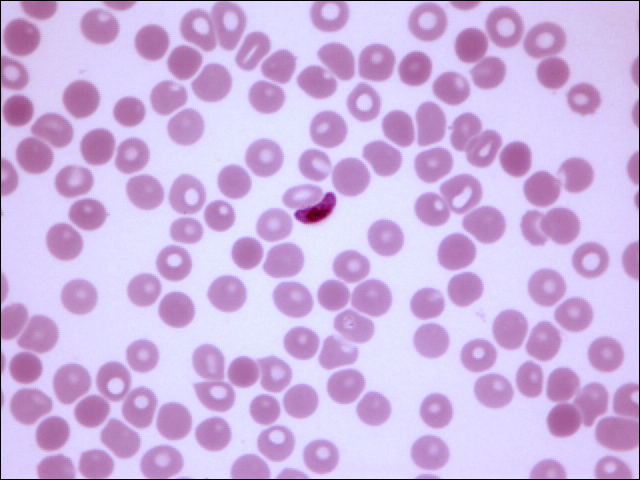 Plasmodium is a small parasite. When an infected mosquito vector bites a human, sporozoites are injected with the saliva. After entering the circulatory system, the sporozoites enter the liver cells. The plasmodium cells go under asexual reproduction once inside the liver cells of their human hosts. Several rounds of nuclear division yield a schizont. When gametocytes are ingested with the blood meal taken ingested by a mosquito, the complex cycle continues again. Plasmodium can be found world-wide from Central and South America, Africa, and Southern Asia. It can be found in areas where there are high concentrations of mosquito vectors and human hosts. Plasmodium is known to cause malaria in humans and infects hundreds of thousands of people each year. The World Health Organization continues to launch efforts in attempt to eradicate endemic malaria with mixed results. Treatment for malaria depends on the species of plasmodium and its density in the bloodstream. "Plasmodium" MicrobeWiki. Retrieved from: http://microbewiki.kenyon.edu/index.php/Plasmodium.